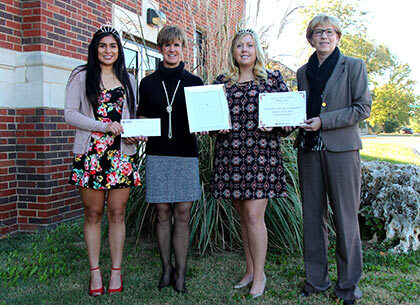 The top-two finalists for Queen Alalah LXXXV, Morgan Bruce and Stephanie Cabrera were recently presented with scholarships. Bruce, who was crowned Queen Alalah LXXXV on Oct. 27, was awarded a Dorothy Moore Harbaugh (Queen Alalah I) Endowed Scholarship worth $600 and a scholarship on behalf of the Ark City Clinic worth $500. Cabrera was presented with a $350 scholarship thanks to General Electric. Dr. Kori Gregg, Cowley College vice president for institutional advancement, and Tasha Bucher, executive director for the Arkalalah Executive Committee, were on hand to present Bruce and Cabrera with the scholarships.